Teton Village, Wyoming is high in the Rockies, on the doorstep of Grand Teton and Yellowstone National Parks. The Teton Mountain Range rises dramatically above pristine forests, rivers and the valley known as Jackson Hole. This rugged mountain landscape offers a profusion of outdoor activities, including downhill powder skiing, snowboarding, cross country skiing, river rafting, fishing, rock climbing horseback riding, kayaking, mountain biking, golfing and tennis. Four Seasons Resort Jackson Hole. 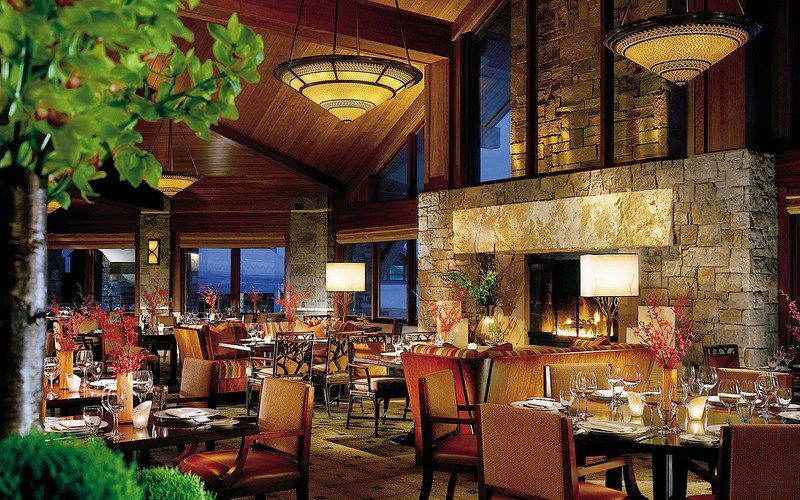 Luxurious Four Seasons Resort offers ski-in ski-out convenience for skiers in the Teton Mountains. Accommodations include guest rooms, suites and private residences capturing the spirit of a mountain hideaway. Amenities include fitness facilities, swimming pool, business services and full service alpine spa. Westbank Grill is situated on the slopes of Jackson Hole Mountain. Westback Grill services distinctive cuisine in an casually elegant atmosphere, with a large stone fireplace, open kitchen and stunning views of Rendezvous Peak. AAA Five Diamond Resort. 1-307-732-5000. Snake River Lodge and Spa.This resort is located at the base of Jackson Hole Mountain Resort . the ski-in property has a heated walkway to the ski lifts. Snake River Lodge consists of guest rooms and luxury condominiums. Amenities include a fitness center, complimentary high speed and wireless Internet access, indoor/outdoor heated pool with cascading waterfalls, hot tub in a steam filled cave and a sauna. Avanyu Spa offers treatments to refresh the mind, body and soul. The Lodge restaurant, Gamefish, features a selection of western American cuisine along with an award winning wine list. AAA Four Diamond. 1-866-975-ROCK. The Alpenhof Lodge. Intimate Bavarian style lodge exudes Tyrolean charm and cozy comfort. Amenities include a heated outdoor pool, jacuzzi, sauna and massage treatments, Dine at the Bistro or at the Alpenrose for fine dining. 1-800-732-3244. Best Western Inn at Jackson Hole. Western style lodge features amenities including an indoor/outdoor heated pool, spa, sauna, exercise facility and cocktail lounge. 1-800-458-3866. Teton Mountain Lodge. Slope side lodge with ski in convenience just steps away from the gondola. Solitude Spa offers holistic, natural treatments. Amenities include indoor and outdoor swimming pools, hot tubs and a outdoor rooftop hot tub. Dine at Cascade Grill House & Spirits. 1-800-631-6271. Information is subject to change. Contact the hotels for additional information and to make reservations.